Telling The Stories That Matter: January 13 - Mev Puleo, Friend of the Poor, One Who Lived a Life "Crammed With Meaning"
January 13 - Mev Puleo, Friend of the Poor, One Who Lived a Life "Crammed With Meaning"
Mev Puleo didn't want you to have the opportunity to look away from the unpleasant. One of her many passions was art and her medium was photography.With a point, a click, and some strange alchemy of chemicals and paper she was able to grasp the face of a child or the body racked by poverty and make a statement that could not be ignored. With the permanence of the photographic image, she was able to convict the hearts and minds of many people who would much rather simply wait a moment and forget all about the plight of the less fortunate. Mev couldn't look away from the passion that for the poor and disenfranchised and so she didn't want you to do so, either. Mev had first been awakened to this calling after having been a Christian for several years. At the age of fourteen, she went on a trip with her parents to Brazil. While they were in Rio de Janeiro and seeing the sites as tourists, they decided to go up and see the "Christ Redeemer" atop Mt. Corcovado. As their bus made the trip up they circled the mountain a few times. On one side, Mev could overlook the homes of the wealthy and respectable. Their homes were brilliantly designed and ostentatiously expensive. In those homes lived a class of people who had little fear for their daily bread. As they came to the other side of the mountain, though, they saw shacks and dilapidated buildings that housed a different class of people. These people were the poor of Brazil and many of their waking thoughts were consumed with fear for their lack of daily bread and anxiety over how to change their circumstances. Mev found herself increasingly uncomfortable with her comfort--she wanted to look away but she couldn't. Suddenly, the chair was too soft, the air conditioning was too pleasant, and the scenery too breathtaking.Her eyes glanced upward to see Jesus standing with his arms stretched wide in the gap between comfort and fear. She feared that though Jesus had been lifted above both sides, it seemed that he had only become a convenient way to avoid looking at the needs of the poor from the comfort of affluence. So, Mev made a decision that day: she decided to change the world. 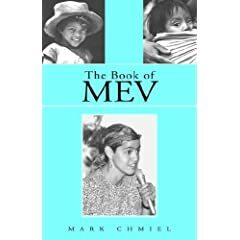 Mev became an outspoken activist and artist who shared powerful convictions and words about the ability of the Church to bridge the gap between rich and poor--between have and have not. She endeavored to increase awareness about poverty as she struggled to end it personally. Her pictures and her speeches refused to give into the temptation to overlook or forget the suffering of so many. Thankfully and gloriously, Mev wouldn't stop pestering the Church about its obligations to all people. Yet, her great benevolence was no insurance against tragedy and suffering. In 1994, a malignant tumor was discovered in her brain--she was given six months to live. Words from the journal she kept in college came calling back to her. She had written that she would rather live a short but meaningful life--a life "crammed with meaning"--then to live long and securely without meaning. Mev ended up living almost two more years after her diagnosis and spent every day of it in service to the God who had called her to change the world. The priest eulogized over her at her funeral: "She had wanted to give the poor a face, a voice. She always wanted to be identified with them. And so it came to pass: by the time of her last days you could see them all in her face--the poor of Bosnia, the hungry of Haiti, the powerless of Brazil. She who gave them voice, lost hers. She who helped us see their faces, could finally see no more....She became the poor she loved." Mev was thirty-two years old when she passed on to rest with Christ her Redeemer.